We hadn’t been to this historic gem of a city for many years, and you know, it was even nicer than I remembered. 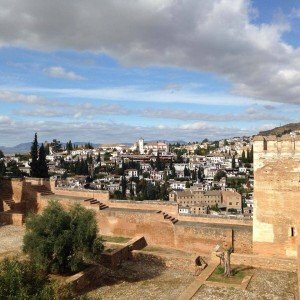 The grand historic buildings and monuments looked as good as ever, the streets even livelier and the number of restaurants, cafés and bars seems to have mushroomed apace with Granada’s reputation as a university city. It is now the biggest Erasmus university in Europe, drawing thousands of especially language students to its lecture halls and exchange programmes. The result is a bustling, young city centre full of atmosphere and friendly mischief – not to mention a truly bohemian chic scene with every kind of tapas bar, restaurant and social venue you can think of, from very traditional and authentic to über-cool and eclectically unique. It was especially the latter that local WABAS hosts Josh Taylor and Molly Sears-Piccavey took us to for dinner and drinks. The gin bar Verdi deserves a special mention here, offering a full menu of gins within a unique decorative setting. But we were also here to work, so the better part of two days were filled with seminars and discussions about online marketing strategies, tools, technologies, does, don’ts and trends, as well as writing, blogging, publishing and, of course, social media. 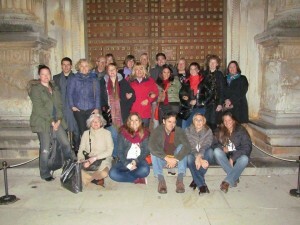 Coming from a wide range of backgrounds and professions, not to mention countries and different Spanish cities in which they work and reside, this year’s large gathering of WABAS members exchanged valuable information and insights in Granada. After two full days of work the weekend’s highlight was a night time guided visit with Cicerone to the Alhambra, and though it was a little chilly this was indeed a magical experience. We were by no means alone in this famous monument, but by comparison with a day visit it does feel rather more intimate and special – especially with soft mist adding a dreamy hue to the views of the medieval Albaicín quarter on the other side of an incised valley. We came away with a new experience, lots of valuable insights and friendships growing in depth and number. Thanks WABAS 2014 – until we meet again in 2015! This entry was posted on Monday, November 17th, 2014 at 5:43 pm	and is filed under Business and technology, Spain, Travel. You can follow any responses to this entry through the RSS 2.0 feed. Both comments and pings are currently closed.